This post demonstrates an effective attack on an obscuring cloud of candidates of a single number, based on freeform enumeration of patterns. It finishes the severely imbalanced review puzzle, GM 95, from Xaq Pitkow’s Sudoku, vol 3. A cloud of 6-candidates obscures the view, but in the East boxes which are relatively clear, two eliminating ANL were found, triggering NE1, E1=>C1=>C2, NEc8np28, NE9. Moving on to the x-panels, I noticed the very unbalanced distribution of candidates shown below. Outside of the 6-panel, we have only dead x-wings, swordfish, or both. Although the conflict logic would probably be productive, I saw the overload of the 6-panel as an opportunity for a decisive number of orphans. There is also a good chance, with the many bv partners in the 6-cloud, that coloring will net removals. Trying that first, I got the respectable cluster shown later, but no traps. Now follow along as I freeform from the right, trying paths top to bottom, in the freeform panel below. I choose to start freeforms from the right, where two column slinks allow only two paths. Any freeform starting in r5c9 must hit r8c8 and r4c4. But to hit r4c4, it must miss r9c4, and therefore must include r9c6. That leaves only r2c5 in c5, and r1c4 in c4. 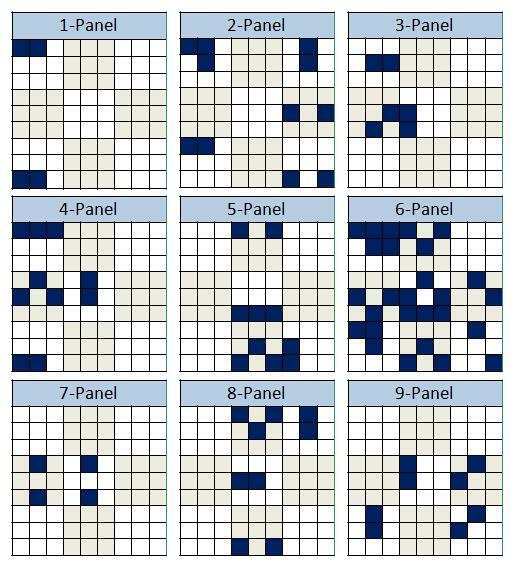 Now it cannot satisfy both rows r6 and r8 by a hit in c2. There is no complete freeform starting in r5c9, and all must start in r9c9 and hit r4c8. This in itself defines two clues in r9c9 and r4c8, and four orphans, namely r5c9, r7c8, r9c4, and r9c6. The removals leave candidate r8c5 alone in the South box, and this clue defines three more orphans, which brings a boxline in Nr1, removing three more candidate, and arriving at the right 6-panel. Yes, the effect on the grid is devastating for GM 95. Some orphans are blue, proving green, and the collapse is immediate. GM 95 teaches a valuable lesson. When a puzzle defeats advanced solving logic with a cloud of candidates, it is also increasing the likelihood of detectable orphans. 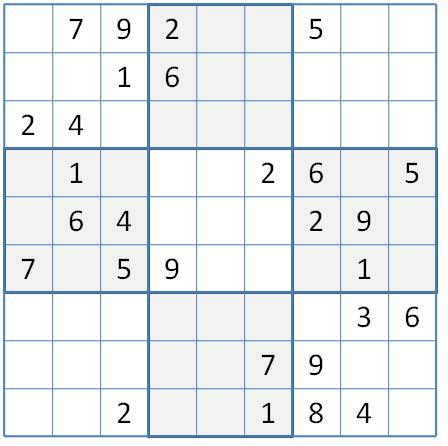 The classically intractable puzzles which are a favorite subject of Sudoku boards feature multiple clouds. But consider this. 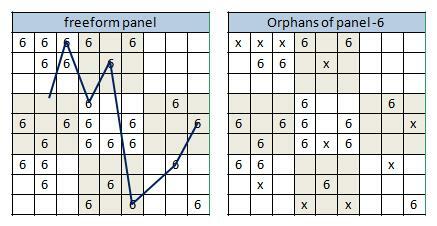 The constraints that produce orphans depend only on the placement of candidates of the orphan’s own number. Every cloud carries its own constraints. The intractable puzzle has to avoid detectable orphans in all clouds simultaneously. A break similar GM 95 will significantly weaken the puzzle. There remains only one true pattern per number. In this game, the human solver may have a chance after all. This review of the Pitkow’s Sudoku, vol. 3 GM’s was fun for me, and I hope, for you. I continue next with this book’s Super Grand Master collection. In this review, I will spend the most time with SGM 10, which you might want to subject to your own basic solving. 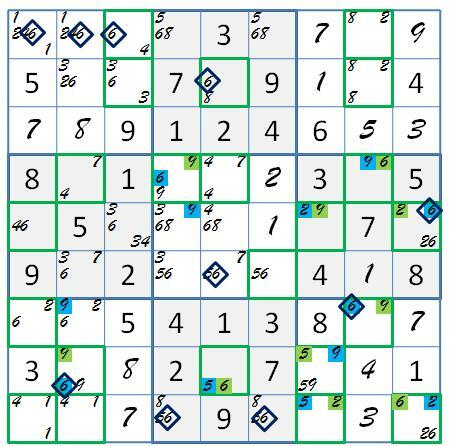 This entry was posted in Advanced Solving, Extreme Solving, Pitkow, Puzzle Reviews and tagged LPO coloring, LPO orphans, sudoku candidate cloud, Sudoku patterns, Xaq Pitgow. Bookmark the permalink.